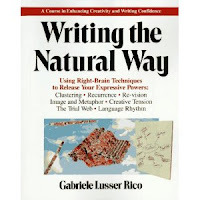 Another book I first read five years ago was Gabriele Rico's Writing the Natural Way. 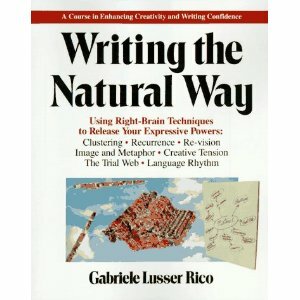 This writing/reference book is aimed at "using right-brain techniques to release your expressive powers." 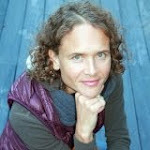 Gabriele Rico, a professor of English and Creative Arts at San Jose State University, promises to "release creative inhibition, end writer’s block, find an authentic voice and discover patterns of meaning." And she delivers with her solution, developed in her doctoral dissertation at Stanford, called clustering and the central idea behind this book. "Clustering is a nonlinear brainstorming process akin to free association. A nucleus word or short phrase acts as the stimulus for recording all the associations that spring to mind in a very brief period of time," Rico writes. "Clustering acknowledges that it’s okay to start writing not knowing exactly what, where, who, when and how." The technique of clustering helps us return to the time when we were all natural poets before the left part of our brain took over between the ages of nine and twelve. After finishing this book and its exercises, you will be the author of at least two full A4-sized notepads. I guarantee that you will be surprised at the quality of your own work. This book is also a great read jam-packed with philosophical and inspiring quotes and examples of fabulous writing. Rico tells us that Nobel Laureate "Roger Sperry noted that an actual physiological harmony – resonance – occurs as the brain’s diverse strengths work together. The reward for this cooperation is a psychological sense of wholeness. Our yearning for such wholeness can be satisfied through creative arts." Rico certainly gives the reader the tools to fulfil this yearning.